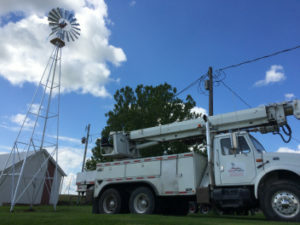 When it comes to windmill repair, you won’t find anyone who can provide the excellence of service and quality care that Great Plains Windmill Service can. We provide a variety of windmill repair, maintenance and restoration services across the Midwest. Whatever your need may be we are sure to have the solution, just give us a call today and we’ll give you a free estimate! Our services include motor repairs and service work, preventative maintenance, painting and lettering, historic restorations and more. We service windmills primarily used for household water, cattle operations, irrigation systems, wetland preservations, pond aeration and simply ornamental. Don’t wait until your windmill breaks further, contact us today for a free estimate! We can be reached at (319) 325-2467 or you can email us.